Our traditional summer camp will be held June 1-5, 2015 at Espoo, Finland (Mon-Fri). This camp has been sold out in good time every year for the past 10 years. We reserve rights to choose the students from applicants in order to create the best possible match, groups etc for teaching purposes and to guarantee that all students get the best possible experience. See exact instruction on how to apply at the bottom of this page. Who is this camp for? Our camp is open for all competitive goalies that have ambitious goals & desire and willingness to work hard. For the past 10 years we have had goalies all the way from younger juniors to adults. For the camp we divide our students to groups based on their age and skills. This way we can tailor the coaching, speed of the drills etc to match everyone’s ideal level. Normal camp days include 2 ice sessions, 1 dryland session, 1 theory session and warm-up & cool down sessions before and after each one of the daily workouts. Every summer Jukka Ropponen redesigns about 30% of the drills based on the development work that GoaliePro has done with it’s pro customer during the past season. A lot of the new drills and methods this coming summer are in the area of lateral movement, utilizing the whole body and having all momentum directed to same direction + control of the movements. We will also put a lot of efforts into proper body maintenance. During this season we have developed new methods for this area also and extra focus will be for the hip area and injury prevention. During the camp students will be able to observe our pro customers doing their own workouts. Most of our pro group goalies will also be on the ice instructing our students during their daily ice sessions. 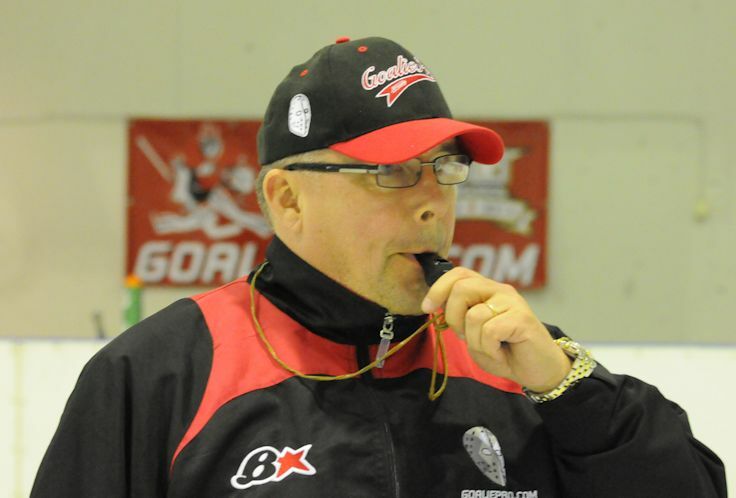 Coaches While Jukka Ropponen is in charge of the overall program and coaches education he is also on the ice for every single ice session making sure all students receive proper / consistent coaching and feedback. The final coaches list will be read about 2 months before the camp opens. Coaches will be chosen from GoaliePro trained experienced goalie coaches with addition of a few new coaches that will participate at our goalie coaches mentoring program. We will have 2-3 students per coach on the ice to guarantee that each goalie will have enough attention and personal feedback. You will not find the same caliber coaching staff at any other camp. The coist of tyhe camp is 730€ and the payment will be due in 7 days after you have been accepted to the program. Due to a nature of our program we cannot accept cancellations, but in case of an injury etc students can appoint a replacement to take their spot if GoaliePro does not have suitable candidates on the waiting list. Camp price covers all workout sessions, instruction, lessons, set of GoaliePro workout gear, professional high protein lunches (design by nutritional expert), afternoon snacks / energy replacement and opportunities to test the latest gear on the ice. Every participant needs to have the needed insurances valid before joining the camp. If your goal is to play NCAA hockey in the future, this is the right camp for you! This summer we have again coaches at the camp with good connections to college’s or coaching at NCAA. During the camp we will also cover the path to NCAA for young goalies. What do you need to do in order to make this happen both academically and hockey wise. Those that make their way to NCAA can enjoy up to 40.000 USD scholarships per season. Studies at NCAA usually take 4 years and while you earn your degree you also practice and play like a professional. In our pro group we have this summer of our ex camp students that have alls started at this very same camp when they were 11-12 years old. Now they are playing at top U.S. colleges. These college players will also work as instructors at our camp and can give you good advice how you can earn your scholarship in the future. See you at Espoo this summer!